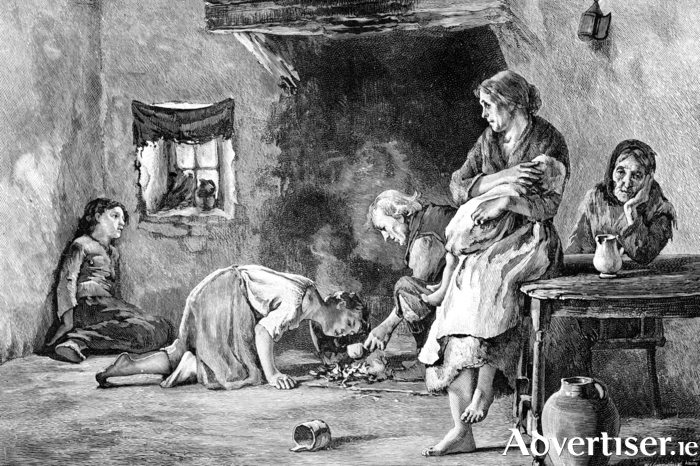 As families began to starve in the 1840s, the British Relief Association distributed black rye bread to children at local schools in the remote west of Ireland. Although Aesnath Nicholson had left Ireland in the summer of 1845, she kept in touch with many of the people she worked with and admired. She had spent 15 months walking or travelling by boat or jaunting car, throughout the country, observing, advising, and distributing Bibles among the poor. She had experienced the pitiful state of the newly arrived Irish emigrants languishing in dreadful slums of New York’s notorious Five Points. She was determined to find out the root causes of their poverty. Nicholson was a deeply religious woman. Brought up in a Puritan household on a farm in Vermont, she had developed her own ideas on what constituted a proper diet (she was vegetarian ), and was an ardent abolitionist. She ran a series of guesthouses in New York, along the lines of her dietary philosophies, which were successful. She also strongly believed that every child should have access to a basic education. Her ideal school was based on a rigorous standard of basic literacy. Such skills allowed a person access to the Bible; but also provided the means to get out of poverty and into work. During her time in Ireland she visited many schools. She had not previously experienced the limitations of class, gender and religion that she met here. Nor was she impressed with the hedge school system, and its teaching of the classics. She admired the developing national schools, and the Protestant and Quaker schools that taught practical subjects such as crafts and hygiene, and the three Rs. To her practical mind, these were the essential tools for finding work in America. Leaving Ireland in 1845 Nicholson must have thought her work was finished. * It was, however, the first year of the Great Famine. She heard about the fate of a teacher she admired, a Miss Carey, daughter of the Mayo coastguardsman Frederick Carey, who had set up her own school on her landlord’s property to teach poor children to read, and to see that they were fed at least once a day. The school worked for a year, but closed when Miss Carey was evicted. Nicholson was told that the children were sent back to their mountain cabins to die. A distressed and angry Aesnath Nicholson raised money from friends in America, and returned to Ireland. This time without Bibles. Nicholson also reports the lethal consequences of the spreading famine in the west. She described a school in Partry, near Ballina, where the local curate gathered ‘a few half dead children’ in a new chapel, perhaps at Kilkeeran, who used the stairs for desks and benches, while they waited, famished, for their bread. There was another school in Ballycroy, Co Mayo, where nearly 100 children, barefoot and shivering, huddled together while they waited for their ration of 10 ounces of bread. Southwest in Louisburg, in April 1848, Nicholson and a friend came across a similar sight, possibly in Fallduff national school, where 90 barefoot pupils squatted on the floor in their rags, waiting for their bread. Despite Count Strzelecki’s reassurance that ‘children like and delight in eating it’ Nicholson declared war on the Count. The ‘black bread’ offended her dietary principles. She described the bread as ‘sour, black and the consistency of liver.’ She vowed to have it withdrawn. Next week: Count Pawel Strzelecki, and the black bread ‘war’. NOTES: She wrote her first book Ireland’s Welcome to the Stranger, an Excursion through Ireland in 1844 and 1845 (originally published in 1847 ). Later she wrote Annals of the Famine in Ireland in 1847, 1848, and 1849. Both books have been reprinted by The Lilliput Press. For this week’s Diary I am leaning heavily on Dr Maureen Murphy’s article Asenath Nicholson and school children in Ireland from Women and the Great Hunger, published by Quinnipiac University, USA. On sale €25.